Jaipur, the state capital of Rajasthan was founded in the year 1727 by Maharaja Sawai Jai Singh, a Kachhawaha clan ruler. Jaipur is situated 258 kilometres from Delhi. Best time to visit October to March. Jaipur, The Pink City, is quite a romantic city. Modern yet flavoured with an old-world charm, the city can never fail to fascinate the visitors. Its history speaks aloud of its regal Maharajas, its grandeur and its colourful 18th century bazaars. The splendid backdrop of the ancient forts like Jaigarh, Amer and Moti Dungri are a reminder of the conventions of the bygone era. Jaipur was once called 'Sawai Jaipur'. The name of the city was derived from the name of its founder. It was built in a modern style with a view to combine aesthetics and commerce. Jaipur is a prominent attraction in Rajasthan today – a city where both 'old' and 'new' co-exist. The intricate architecture, vibrant bazaars, splendid forts and palaces clearly depict the rich cultural heritage it beholds. 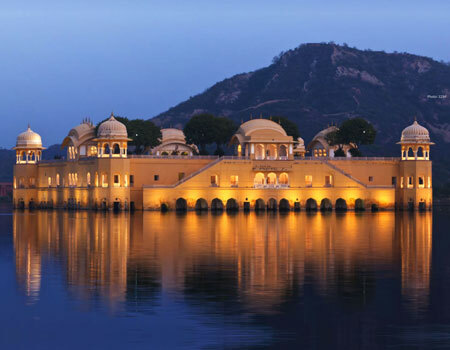 Flights to Jaipur are available from all the major cities Delhi, Jodhpur, Calcutta, Mumbai and Udaipur. At present, flights to Dubai are also available from Jaipur. Because of the efforts of Rajasthan Roadways, comfortable and air conditioned buses now connect Jaipur from Delhi. The network of roads is also good and it takes around 5- 6 hours to reach Jaipur from Delhi. A visitor can even opt for a taxi. Jaipur is connected to all the metropolitan cities through regular trains.